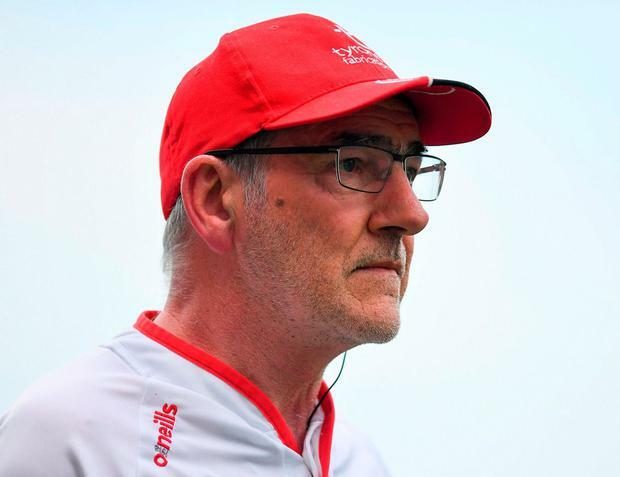 In the end, Mickey Harte was left searching for negatives. His team scored 4-24 in the inaugural Super 8 fixture yesterday yet Harte clearly felt it pertinent to douse the flames of expectation somewhat ahead of next Saturday's visit of Dublin to Omagh. "We're obviously pleased with what we scored," the long-serving Tyrone manager said after a wholly impressive 18-point victory over Roscommon in Group 2 of the officially titled All-Ireland quarter-final group stage. "But there's obviously a down side to all these things. We're not pleased with what we conceded. That would give us a cause for concern." Tyrone's previous visit to Croke Park was last year's All-Ireland semi-final when Dublin scored 2-17 in a surgical dismantling of their defence. And in the circumstances, 2-12 was probably too big a score to allow Roscommon to accumulate yesterday. Yet the numbers at the other end are hugely promising. Tyrone's tally takes them up to 13-106 this summer, or just over 24 points per game. 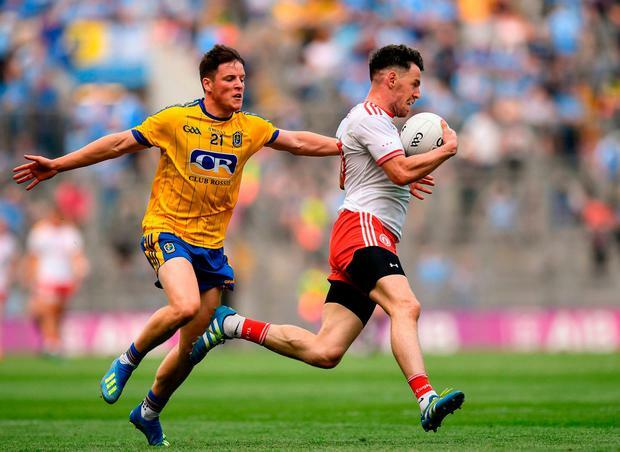 No side has their style as minutely analysed as Tyrone yet the figures prove them to be among the most prolific teams around these past two years. "I'm very pleased with it," Harte said. "It just shows that you can get your scores in many different ways. It doesn't have to be the orthodox old-style anything. "If you can create scoring chances and have people to take them, that's good for me. And we're trying to work the best way possible for our players to play the game. That's what we're trying to do. This is only one day. There will be different challenges for us next week and we'll have to see how we respond to them. "We can't be saying much about what we're doing until we meet the acid test and the acid test is coming to Omagh next week." Tyrone came to Croke Park with lingering questions over their compatibility with Sam Maguire but left with fewer. 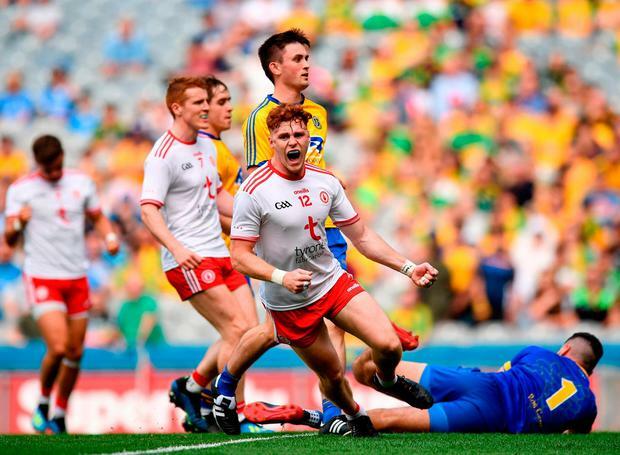 After an initial feeling-out period - played out in front of a notably sparsely populated Croke Park for the first game of the day - Tyrone seized on the biggest mistake of the half to seize the advantage. Leading by a point in the 12th minute, Roscommon turned a ball over when Enda Smith inexplicably kicked a cross-field pass straight to Niall Sludden. Though Tyrone had no player inside the scoring zone at the time, they moved with stealth and menace, advancing in a calculated swarm. Four handpasses later, Sludden finished the move he started. Roscommon scored two further points but then faded badly. Their last of the half came on 22 minutes, after which Tyrone kicked six in a row. Every turnover infused Tyrone with energy and killed Roscommon a little bit. Their first-half total of 1-10 came via eight different scorers, three of whom started in defence, while their efficiency was reflected in the fact that they shot just two wides in those first 39 minutes. Three minutes into the second half, Smith got the goal Roscommon so badly needed but four points was as close as they could get. All the game's best men were from Tyrone. The perpetual motion of their runners created overlaps with startling speed. Sludden, as he has all year, was central in Tyrone's creative hub and he scored 1-2. Richie Donnelly, meanwhile, provided a sticky outlet for every ball they decided to kick long. An erstwhile midfielder, Donnelly kicked 1-4 yesterday. "He had difficulties with injuries there for a year or two that didn't help his progress but when he stays injury-free, he's a really good footballer," Harte said of his converted full-forward. "He's a really smart footballer. He's a physical presence. So he has a lot of things that are really useful for that position. So he's seizing his opportunity with both hands at the minute." The victory, handsome though it clearly was, still probably leaves Tyrone needing a victory in one of their two finals games against Dublin next Saturday or Donegal in Ballybofey on August 5. Of next week's looming date with their All-Ireland semi-final torturers from last year, Harte said: "It is something special, no doubt about it. "We could have been out of it altogether on the day we played Meath in Navan. We might not have been in this place at all. "We used some of our luck up that day. And then I think we learned to build on that. Sometimes you get an opportunity,. It's very fine line between a degree of success and a huge failure. So we have a degree of success at this stage and we'd like to keep it going a while longer." Scorers - Tyrone: R Donnelly 1-4, P Harte 1-3, N Sludden 1-2, C Meyler 1-1, C McAliskey 0-4, C McShane, M Bradley 0-2 each, M McKernan, R McNamee, T McCann, M Donnelly, D McClure, R Brennan 0-1 each. Roscommon: C Murtagh 1-3, D Murtagh 0-5, E Smith 1-0, F Cregg, C Devaney, C Daly, P Kelly 0-1 each. Tyrone: N Morgan; M McKernan, R McNamee, C McCarron; T McCann, F Burns, P Harte; C Cavanagh, P Hampsey; M Donnelly, N Sludden, C Meyler; C McShane, R Donnelly, C McAliskey. Subs: HP McGeary for McCarron (19), K McGeary for Meyler (50), D McClure for Cavanagh (51), M Bradley for McAliskey (55), R Brennan for McKernan 58), R O'Neill for Sludden (59). Roscommon: C Lavin; D Murray, J McManus, N McInerney; N Daly, Fintan Cregg, C Devaney; T O'Rourke, E Smith; C Murtagh, N Kilroy, C Cregg; D Murtagh, C Compton, D Smith. Subs: B Stack for C Cregg (h-t), Finbar Cregg for D Smith (h-t), G Patterson for Daly (46), C Daly for Fintan Cregg (53), S Killoran for C Murtagh (62), P Kelly for E Smith (65).